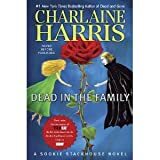 Even though it’s been less than two weeks since I’ve read Charlaine Harris’ latest addition to the Sookie Stackhouse / Southern Vampire Mystery series, I don’t remember much about it. I don’t mean that I didn’t enjoy it, because I did, or that it wasn’t well-written, because it was, but that it seemed like it didn’t really have a definitive plot. Oh, I mean, there was a stray faerie, and an unidentified shifter, but most of the book seemed transitional. For example: Sookie is dealing with the aftermath of losing her “fairy godmother,” forging a relationship with her young cousin, who shares her ability, trying to find boundaries in her relationships with Eric (romantic) and Bill (who, quaintly, is still referred to as Vampire Bill by most of the folks at Merlotte’s, but, while there’s some wrapping up of loose threads, and some setup of future events, book ten feels very much like the middle novel of a trilogy, making it one of the rare books in this series that HAS to be read in order or the reader will be left completely confused. Diehard Sookie Stackhouse fans will not want to miss this book, which came out six weeks ago (giving book clubs enough time to discuss it before last Sunday’s beginning of season three of True Blood), but I’m left feeling like the story wasn’t complete. Less is more, of course, as the adage goes, but…this book included a visit to Eric’s house, and I’m not certain if I know whether or not his taste runs to modern furniture, or something much more exotic. Goes well with: peach pie and sweet tea. In this, the ninth novel in the Sookie Stackhouse mysteries, and the second to take place post-Katrina (unlike the HBO series True Blood, which takes place entirely post-Katrina), we are given lots of big information that we didn’t have before, and we witness some huge events. The book opens with the Big Reveal – the national coming out day for weres and shape-shifters, and as it happens on tv, it also happens in Sam’s bar, with him displaying his prowess at becoming a collie. Of course, this light scene is a tease, because we are almost immediately confronted with the sight of Sookie’s brother’s estranged wife strung up – no not on a column of industrial hand wheels – but on a cross. Of course, Jason is the prime suspect, but Sookie is sure he didn’t do it, and while she tries to solve the mystery – and preserve her own skin – we are treated to a significant amount of information about her great-grandfather the Faerie, and given more than glimpse into Eric’s backstory. Of course, it’s all wrapped in the fast-paced, quip-laden action and dialogue we’ve come to expect. Dead and Gone is a fast read…but a good one.